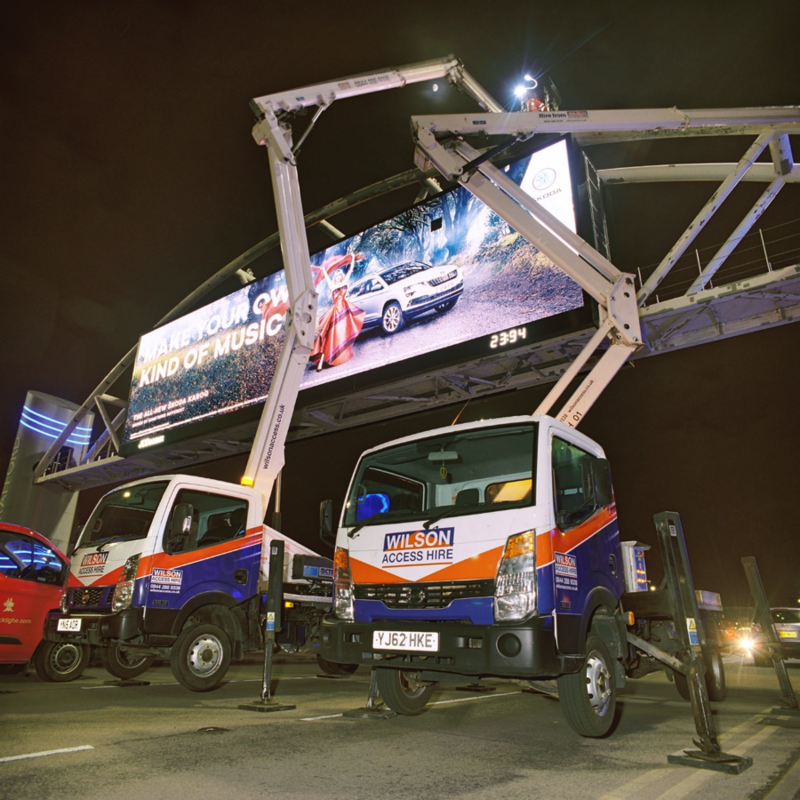 Two 21m Truck Mounts from the Wilson Access fleet helped industrial painting contractors repaint the prestigious Trafford Arch Digital Advertising Site in Manchester. The Trafford Arch digital advertising site is owned by media giant JCDecaux and provides two digital screens on the A56, one of Manchester’s key arterial routes. The site was the first in the UK to span a major road. It has a width of 46-metres and weighs an estimated 50 tonnes. The work involved sanding down, priming and repainting the entire Arch over a 6-week period. The industrial painting contractor worked with Trafford’s traffic management scheme to physically shut both sides of the dual carriageway each night from 11pm to 5am. They hired the 21m Truck Mounts from Wilson Access as working across the embankment and the barrier wasn’t possible with a scissor lift. The Truck Mounted platforms were the ideal application for the job as they had to be taken offsite at the end of each night shift. It wasn’t possible to leave access equipment on site for security reasons, so the trucks were a perfect solution, as they could be moved to a secure yard at the end of each shift. The project duration was due to be 6 weeks, but the versatility of the Truck Mounts meant the project was completed early in just 5 weeks. The Wilson Access Truck Mounts hired by the contractor both have a maximum working height of 20.70m and a 9.90m horizontal outreach. They are part of a fleet of 70 Wilson Truck and Track Mounted Platforms with working heights from 14m to 57m.